Guru Maa Rokmani Ji is a Celebrity Astrologer and a Spritual Guru. She has done MBA but has a Deep Experience and Knowledge of 10 Years in Astrology. Guru Maa is Famous in 133 Countries. Puja and Yagna specialist, also she is Teaching Meditation World Wide. Guru Maa is a Famous Shrimad Bhagwat Katha Preacher. Guru Maa is also an Author of many Books. She has been Telecasted in many TV Shows and is having 3000+ Youtube Videos. Guru Maa is having Millions of Followers World Wide. About 30 years ago an engineering student got inspiration from within and decided to dedicate his whole life in search of "Eternal Truth" and to "Help" the people who are in trouble. After knowing Real Facts about the huge number of so called Spiritual Gurus, many Frauds Sadhus and Cheaters - Dhongi Babas, Guru Rajneesh Rishi Ji Lived in a Graveyard ( Kabristaan ) for more than 3 years in District of Nainital and realised the Real Truth of this World. Making Almighty SGod his only Guru, he went deep inside to find the answers of so many unanswered questions. After 20 years of experience and knowledge he attained the supreme state. By the grace of Lord Shani Dev, Guru Rajneesh Rishi Ji solves all their problems and never send them empty handed. Surprisingly, not only general public, Temple Pundits, Sadhus, Astrologers, Foreigners, Senior Doctors, University's Dean and Registrars, MLA's, Ex-Ministers, Industrialists, Business Tycoons, Film Stars, Film Producers, Jain Sadhvis and Brahmkumaries can also be seen here to get Blessing and Consultation from Guru Rajneesh Rishi from all over the world. This all is just due to Divine Shani Peeth and its Purity. At "Shani Peeth", Lord Shani Dev never returns Any Person empty handed, infact everyone gets a new way to Happiness, Peace and Prosperity. 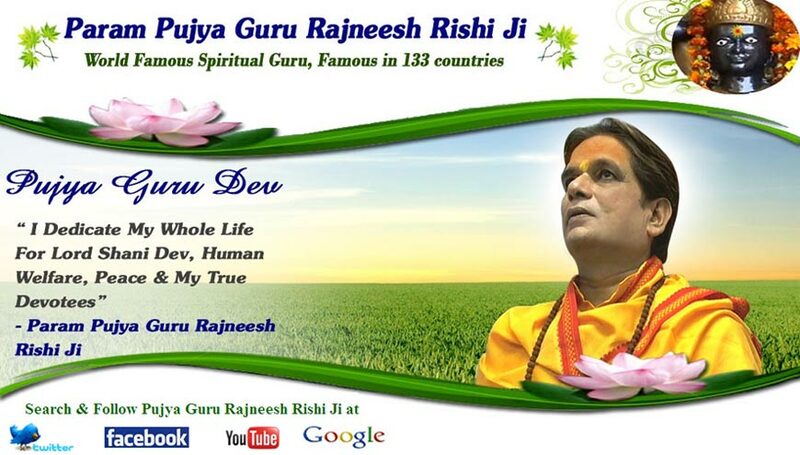 FOLLOW THE LINKS BELOW TO CONNECT WITH GURU RAJNEESH RISHI JI : YOUR GUIDE FOR ALL PROBLEMS !